I guess I'll start out with my favorite recent fashion upcycle (I'm trying to get away from the phrase "Refashion", LOL) even though I posted it on another blog, lol I'm sure that will all be wiped away soon so I'll post them over here too. 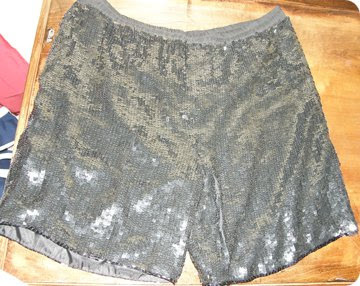 I bought these black sequin shorts (left) at a Goodwill Outlet for less than $1 (they sell their clothing by the pound). I LOVE all of the new sequin trends out there right now, but the really sparkly, very heavily sequined pieces are always so expensive or simply just don’t come in my size. I’ve never worked with sequined fabric before so I wasn’t sure if it was all going to fall apart on me or not, but I tried to be very careful with it and I didn’t cut the fabric at all, I just took it apart at the seams. The first thing I did was take them apart at the seam that goes down the front, around the crotch and up the back. Next I removed the elastic waistband completely. I then cut the liner out of the shorts and set it aside. I sewed the waistband side 3/4 of the way. 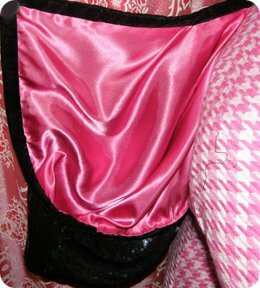 I used the liner to cut a NEW liner in one piece out of the hot pink satin. 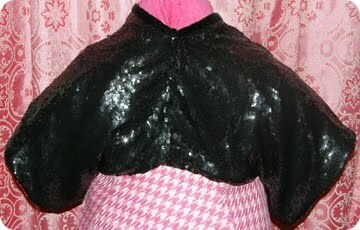 I sewed the liner inside the newly constructed shrug. The edges around the neck were a bit sharp from the sequins so I cut a length of black velvet ribbon, bi folded it and ironed it. I started just past the underarm seam on one side and wrapped the edge of the garment in the velvet continuing around the neck and down to a couple inches past the underarm seam on the other side. I LOVE IT! I Want one. I also love your form. Did you make it yourself and cover it in the pink houndstooth? THANKS! Yes I did, it's a duct tape form, stuffed with the innerds of old couch cushions. lol I rammed an old mop handle up the bottom, strategically pl;aced some pieces of cradboard so it wouldn't ram through and then slide an old standing fan base over the mop handle. There is an old bra in there somewhere too! lol... The houndstooth was some fabric I bought a long time ago for $1/yrd before I swore off Walmart. I had just enough to cover it. The rest is just pink velvet scraps. I just sewed the houndstooth right onto itpulled it off and flipped it inside out and there you go. I wanted something a little different! I haven't transfered the post about it over to my new blog address yet, but here it is on the old one. I like your sequin shrug, I have just been given a sequin jacket that is very square and basically looks a bit frumpy on my but I'm determined to make something out of it!! I was thinking a big bag!! that sounds cool! I love sparkley things! I also bought a black sequin skirt the same day I got this and I've been trying to figure out how I cam make it into a tank top, it's for about a size 8 so it won't go around me at this point. I might make the back out of a different fabric or might make something else out of it altogether. Each thing tells me what it wants to be, I just have to listen closely enough!